Main Informations: What is Yakshagana? Yakshagana is a traditional dance drama Indian art originated from Canara region in Karnataka . It is first mentioned in 1105. It arose in the 15th century. Actually it is the product of the Bhakthi movement in South India. In essence of Yakshagana is a form of folk art, borrowed some elements from the classical forms of drama and South Indian dance. Ancient time it is used to describe the music played at the courts of feudal lords. It is originated on the basis of traditional forms of song and dance that existed in Canara and other regions of Karnataka. Yakshagana is performed only by men not by women. The performance of Yakshagana is conducted in the orchestra, consisting of drums, stringed instruments and cymbals. One of the most interesting aspects of Yakshagana is its elaborate make-up code. The makeup of Yakshagana is very elaborate. And the costumes of Yakshagana are large. The performances of Yakshagana generally depict scenes from South Indian epics and Indian epics (Ramayana and Mahabharata). It is one of the oldest dance forms considered. It is a spectacular mix of drama , dance and music. Characters alive with painted faces and elaborate costumes tell stories from the Indian religious epics. 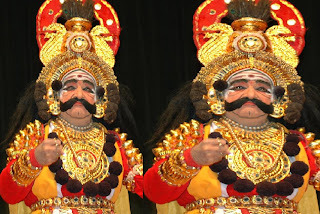 There are two styles of performance in Yakshagana. That is Northern Yakshagana and Southern Yakshagana. The main difference lies in the staging techniques and costumes. Northern Yekshagana style is not more flamboyant ornate costumes.